You will agree that having a successful website involves much more than just creating a great looking website with tonnes of features. One of the major challenges is to maintain the site after getting it hosted on a reliable web hosting platform. Different people give importance to different criteria when choosing their ideal web host for their site or blog. You will definitely look for a reliable hosting company that has a good relevant experience to make your task easier, irrespective of whether or not you have hosted a website before. You are bound to trust your web host if it is popular and you have read good customer reviews about its services. Two such experienced website hosting service providers trusted by millions are Bluehost and GoDaddy. We compare the hosting services offered by Bluehost and GoDaddy to help you choose the one that best meets your hosting requirements. So here is a detailed comparative study about the various features of Bluehost and GoDaddy, along with the hosting plans and pricing plans offered by them. Bluehost is a much better web host than Godaddy and offers a much better set of tools and performance – especially if you look at their shared web hosting packages and WordPress hosting options. They are rated highly in our web hosting reviews. Below you will find our full comparative analysis. Bluehost (founded in 1996) and GoDaddy (founded in 1997) have almost exactly the same amount of experience. Bluehost is owned by the Endurance International Group (EIG) and focuses mainly on web hosting services. GoDaddy offers other services in addition to web hosting, such as domain registrations and SSL certificates. GoDaddy has always been known for its aggressive advertising, for example, its Super Bowl ads. This has made the company very popular in the general world, while Bluehost is only famous in the web hosting world. But, that doesn’t mean that GoDaddy is a better web host than Bluehost. 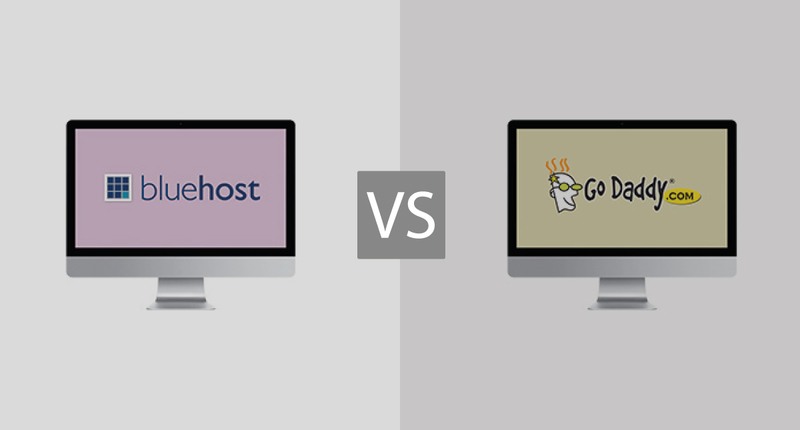 Here we compare Bluehost’s and GoDaddy’s important hosting features one by one. Bluehost does not claim any particular uptime guarantee, but offers a significantly high uptime percentage of almost 99.9%, while GoDaddy claims to offer an uptime guarantee of about 99.9%. No one likes their sites or blogs to be down for long and the actual uptime performance does have a strong bearing on how satisfied you are with your web host. GoDaddy’s actual uptime percentage is less than Bluehost and so you ought to prefer Bluehost for their very high uptime. The minimum server response time or page load speed is almost alike for both. However, Bluehost’s maximum server response time for any site is considerable lower than that of GoDaddy. Also, GoDaddy’s customer reviews include plenty of complaints about outages or downtime. So, it is clear that GoDaddy-hosted websites may not be able to handle significantly high traffic with great server response time. Bluehost is a better bet in terms of this feature. The data centers of GoDaddy and Bluehost are quite robust and their servers are pretty powerful. Bluehost runs on AMD power centers and uses CPU segregation technology that allows it to intelligently control the CPU and protect your website against viruses and spam attacks. GoDaddy’s servers run on Intel Core i7 processors and you can choose between Windows OS or Linux OS when you sign up for their services. In terms of performance, both web hosts seem to be pretty similar. Whether you are an experienced webmaster or a newbie, you will require timely technical support from the web host team for any real-time issues which cannot wait. With Bluehost, you can completely rely on their customer support team to provide a timely response and support. However, the GoDaddy support team has been found wanting by several customers, as they tend to keep the customers waiting for a long time before replying. In case of an emergency, Bluehost customer support will always be preferred. Both offer numerous options to contact their customer support team, round the clock. You can make use of live chat, email, ticketing system or toll-free telephone number. Both hosting providers offer the industry standard cPanel as the control panel for hosting. GoDaddy also offers an additional option in the form of the Parallels Plesk panel, as it even supports Windows hosting. You can install several applications required for your site with a single click on both hosting platforms. Bluehost allows you to manage multiple sites easily with access to unlimited MySQL databases, while GoDaddy offers access to limited MySQL databases with its shared hosting plans. Bluehost offers a money back guarantee period of 30 days for all their hosting plans with a pro-rated refund policy, before which you can decide to make a switch to any other web host if you are unsatisfied. You can try out any of the GoDaddy hosting plans (annual only) for a period of 45 days before opting out. This considerably high money back guarantee period offered by GoDaddy indicates their confidence in their own services. Thus, GoDaddy is the clear winner here. However, it may not matter much in the end as even a 30-day period is long enough to judge the kind of hosting services on offer. You get a free domain with hosting plans offered by both web hosts. Bluehost offers only Linux hosting, while GoDaddy provides plans for Linux and Windows hosting. We will only compare the Linux hosting plans of GoDaddy with that of Bluehost, as GoDaddy is clearly the undisputed winner in terms of Windows hosting. We provide a detailed look at the features for the different plans later. The cheapest price for any Bluehost hosting plan is $2.95 p/m for the Starter shared hosting plan on a three-year subscription). The lowest price for a GoDaddy hosting plan is $3.99 per month (for the GoDaddy Economy plan with a three-year or two-year subscription). With regard to the other hosting plans, especially the premium ones, Bluehost is more expensive than GoDaddy. However, Bluehost also offers more comprehensive features, such as unlimited email accounts, unlimited MySQL databases and higher storage, than GoDaddy. With Bluehost, you do not have the flexibility to subscribe to any of their shared hosting plans for a short term. You can only use the one-year, two-year or three-year subscription options with them. GoDaddy allows you to subscribe to their shared hosting plans for shorter terms, such as for three months or even one month (except for the GoDaddy Economy plan). For other VPS and dedicated hosting plans, you have similar flexibility offered by both in terms of subscriptions. Verdict – BlueHost WINS OVERALL! Bluehost is the most reliable and highest performing web host, even though GoDaddy offers a wide range of products other than hosting services. However, if you are looking for Windows hosting, then you can go for GoDaddy. Also, if your website is relatively new and you do not wish to spend so much initially, you can go for GoDaddy’s shared hosting plans. However, as your traffic increases, you need better reliability and uptime. In such cases, Bluehost will be the right one for you. Extremely helpful. I am currently with GoDaddy and have been really unimpressed with the performance. I’m potentially going to change once my contract is up. Thanks for sharing our views. I am using Godaddy although every this says unlimited but then there is capping of 512MB on RAM , which means unlimited space and bandwidth doesn’t mean anything , the websites are crashing every now and then as soon there is little traffic on the website or the developers are working on wordpress. A lot of shared hosts have unofficial limits on their Unlimited hosting packages. If you are using so much RAM I would probably look at why your website is using so much RAM. Are you using any form of caching? I agree that Bluehost wins in some categories but not all. I used GoDaddy for the last 10 years or so to host multiple sites and recently combined two multimedia heavy sites into one larger site running WordPress. I enabled caching in the htaccess file, installed two caching programs, minified all of my code, reduced the size of all graphics, offloaded all video to external providers yet the page load times were still around 10s or more on GoDaddy. Also, I kept getting emails stating my resources had been throttled for 24hrs. Very frustrating to say the least. So decided to try Bluehost to see if they were any better. The migration was painful because GoDaddy once again limited my resources even during the migration so the migration plugin kept failing. I had to FTP parts of my site to the new location and use the migration plugin for the databases and core files. Painful to say the least. After getting to Bluehost it was a pleasant surprise to see that backups, the SSL cert, and a CDN were all included in their hosting plan; something GoDaddy charged separately for. I was also able to sign up for their hosting plan for the introductory price for 5 years which is awesome. Security – GoDaddy let me enable two factor authentication for my cPanel and required a PIN when calling in. Bluehost has no options for two factor auth and even weirder asked me for the last 4 characters of the password; I’ve never had any provider ask me for any parts of my password, this tells me they can even see my password in plaintext which is very concerning to me. Customer Service – While migrating I had a question around 11PM at night and called the support line. I was on hold for over 20 minutes before giving up and hanging up. GoDaddy never kept me on hold that long no matter the time of day or night. Additionally, while migrating I edited my hosts file to view the site before cutting over the DNS. I called Bluehost support when the site was not working and they did not know what a hosts file was or why the site was not working and just said they could not help until I cutover DNS. If I had followed their instructions my site would have gone down for hours until the problem was resolved. I figured out the problem on my own and fixed it. I think GoDaddy would have been more helpful. Despite the negatives, I still stuck with Bluehost due to the page load times, all services included in the one hosting plan cost, and I will save $500+ by using Bluehost’s hosting plan vs. GoDaddy since I was able to lock in the introductory rate for 5yrs.